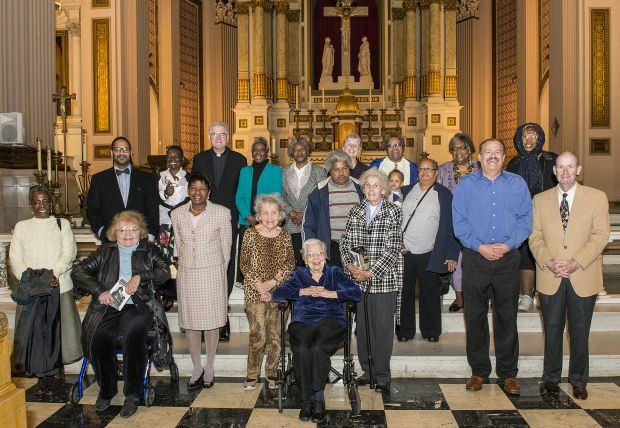 Former parishioners gather again at Church of the Gesu in North Philadelphia to celebrate the 125th anniversary of the church, which now serves as a chapel to nearby St. Joseph's Preparatory School. The parish closed in 1993. 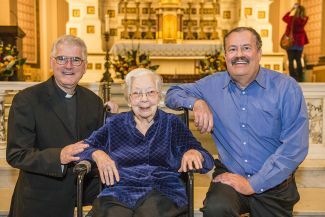 Former parishioner Mary Rita DiDonato visits with Jesuit Father George Bur and her nephew Dennis Scott. DiDonato was baptized in the church in 1915 and remained a member until the parish closed in 1993. St. Joseph’s Preparatory School celebrated the 125th anniversary of the Church of the Gesu Nov. 10 with tours, Mass and a historical reflection at the church. Nearly 500 people attended the event including many former parishioners of the parish, which closed in 1993. The church, located at 18th and Thompson streets in North Philadelphia, is now a chapel for the Prep. Jesuit Father George W. Bur, president of the Prep, was the pastor of the Church of the Gesu when it closed and was the founding president of the Gesu School, located on Thompson Street between 17th and 18th Street. He celebrated the Mass, remembering key moments in the church’s history both for the Prep and the parish. St. Joseph’s Prep historians Bill Conners and Leo Vaccaro gave a presentation on the history of the church and were among the four tour guides who offered insight into the interior and exterior structure of the historic building. Among the participants in the celebration was 98-year-old Mary Rita DiDonato, who was a member of the parish and was baptized there in 1915.